Ventless dryers are a go-to option for apartments, condos, and other living situations where outdoor venting isn't possible. In the US, we're used to seeing the steam outside of our window when the dryer is running, but in Europe these ventless dryers are more common than vented dryers by a huge margin. If you're looking for a new ventless dryer for your home, one of the options to consider is heat pump dryers. Heat pump dryers are a newer type of ventless dryer. In general, ventless dryers are more expensive than vented options. The two major types are condensation and heat pump dryers, and heat pump dryers are more costly up-front than condensation dryers. However, the operating costs are lower - half or more the cost per load of a traditional vented dryer in gas or electric. In this article, we'll explore heat pump dryers from Whirlpool. 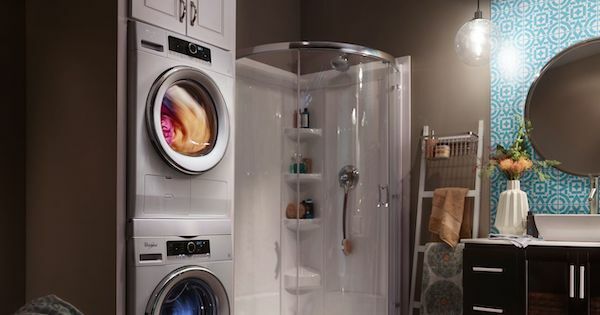 While many condensation dryers are compact dryers, Whirlpool offers these unique ventless models in both compact and full-size models, so they can be a great option for larger households as well as small ones! You can explore even more options for buying a new dryer in our dryer buying guide, too. If you think of your clothes dryer as being one of the simplest appliances in your home, think again. Most people think that it just turns a drum and blows heat, but there's quite a bit going on inside that big metal box! If you are in the process of researching a new dryer, you know there are many brands, models, and features to consider. 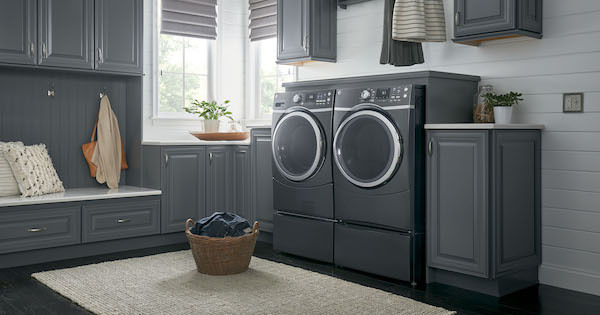 We'll compare LG and Maytag to help you determine the best clothes dryer brand for you. In order to compare the two models, we need to first look at some of the technology behind drying clothes. Clothes dryers have a variety of safety features to not only go easy on your clothes by preventing over-drying, but also keep your home safe if something malfunctions. The average system will have a temperature range of 80 to 190 degrees Fahrenheit, depending on selected cycles and settings. There are two main ways for a dryer to keep track of the drying progress: moisture sensors and thermistors. Older electric dryers are just one of the many household products in your home that may be serious energy hogs. As they age, dryers lose sufficient fresh air intake as well as heat and moisture discharge capabilities due to a number of factors, such as worn or broken blower wheels, worn or dry-rotted drum seals, stretched belts, or slow motor rotation and aging thermostats. And, of course, keep in mind that all dryers accumulate lint within their components throughout their lifetime. If you’re finding your current dryer either gobbles electricity or needs multiple runs to properly dry your laundry, then wait no longer … it's time to replace it. New dryers have more efficient motors and blowers, fresh drum seals and better thermostats and moisture sensors, allowing them to finish the job quicker, which means less run time and thus lower operating costs. When you begin your dryer research, consider the brands GE and Frigidaire. Both GE and Frigidaire have been in the laundry business for as long as we can remember for good reason: quality products! We've put together these electric clothes dryer reviews of two of their top budget-priced models to help you make an informed decision. 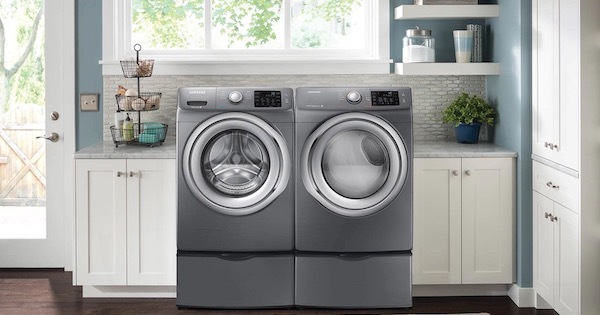 Samsung and LG are two powerhouse brands in the laundry industry. If you are looking for the best dryer for the money, these two definitely offer great value. These brands offer cutting edge technology and innovative features. Their products are reliable and efficient while being stylish and user friendly. These two brands should definitely be on your shopping list when you are researching new dyers. They are here to stay as major players in the US appliance industry. Dryers are not all the same. Some companies still offer very basic models that hit the low price points. However, if you are looking for the newest features and better performance, you'll get it in these two brands. Take a look and see what they have to offer. Let's compare two of their top selling front loading models! Every consumer shopping for a new gas dryer is searching for the best dryer for the money. Gas dryers are available in all brands and styles and with new features and sizes, and they have become more expensive than their matching washers. If you are looking for a good basic gas dryer, there are two companies that you can turn to that can fill the need for great products at the right price: Amana and Hotpoint. Amana, a Whirlpool brand, and Hotpoint, a General Electric brand, both offer gas dryers that are well-featured for their price range and can handle the workload for most families. They make quality products with the basic features that are just what many consumers need, saving sometimes hundreds of dollars in the family budget. Check out these two companies when you go shopping. In this article we'll compare two of their best low cost offerings. For more information on buying a new dryer, check out our dryer buying guide! Side Venting Dryer - Need a Good Side Venting Option? 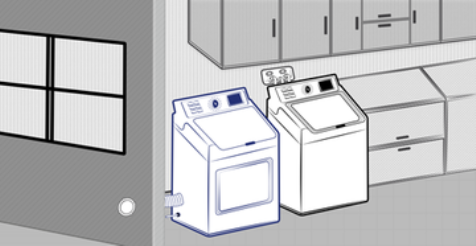 There are several important questions to consider when doing your research on a new dryer. How it will vent is one of them. Depending on the configuration of your laundry room or closet, you may find that you need a good side venting option. Standard dryer installation calls for rear venting but due to space limitations or configuration, you may need to look for a model that allows side venting. Not all models do! It's important to bring this up with your local appliance salesperson, because different brands and models have different restrictions for the options to install side venting. For example, you may only be able to side vent on one side of the dryer - most gas dryers can only be side vented to the left because of the burner housing. Dryers with "four-way venting" usually will allow you to install a side vent on either side. Are you in need of a coin operated washer and dryer for your apartment or other commercial use? 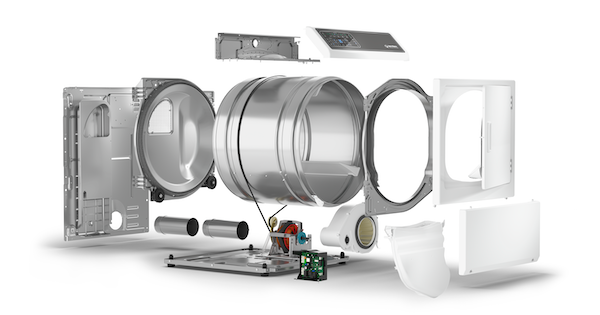 Are you wondering where to begin in the process of researching a new dryer? 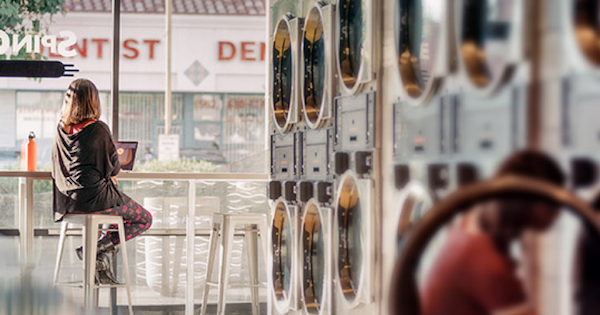 Installing coin operated washers and dryers can be a great way for landlords to increase their monthly income on apartment rentals, and if you're an entrepreneur in the laundry business, you may be looking for new machines for your laundromat. There are several coin operated dryer models on the market, but they aren't as widely advertised as traditional dyers. In this article, we'll profile top-selling commercial washers and dryers from manufacturers Whirlpool and Speed Queen. Whether this is your first purchase of a coin operated dryer or you're replacing an existing model, taking a close look at the features of these models will help you compare and contrast with other models you are considering. Looking to learn more about Amana gas dryer models? You've come to the right place. If you're in the process of researching your options for a new dryer, Amana is a good place to look for cheap but reliable appliances. This trusted manufacturer of quality home appliances is now owned by Whirlpool corporation, but they've retained their focus on value. In the gas dryer market they offer just two products, but they're certainly popular! Let's take a closer look at a well-priced Amana gas dryer in the top load and front load styles. And check out our dryer buying guide for more info on choosing a new dryer! Speed Queen Commercial Dryer - Commercial Quality for Home Use! 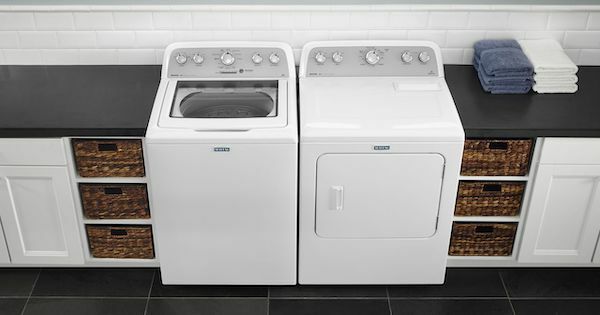 There are lots of factors to consider when researching a new dryer. Some consumers want all the latest bells and whistles on their washing machine, but we are finding more and more that many consumers want a basic heavy-duty dryer that is easy to operate and will last for years. If you're one of those consumers, a Speed Queen commercial dryer might be exactly what you are looking for. Don't be scared off by the word "commercial:" these machines are built for commercial applications but are designed and marketed for home use. Let's take a closer look at one of their awesome models built for dependability and simplicity of use. Are you researching new dryers and wondering about the differences between a gas dryer vs electric dryer? There are a few situations in which you may need to decide which type of fuel you want your dryer to use - for example, if you have both fuels available in an existing home, or you are building a new home and trying to decide which hookups to install. Most common dryer models come in both gas and electric but there are key differences to consider. Let's take a closer look at the major factors that set them apart - and check out our dryer buying guide for more info on choosing a new dryer.